Our electric airless sprayer is an ideal tool for sealing, painting, coating and cleaning of asbestos cement products or asbestos containing materials (ACM’s). Part of our range of asbestos supplies, our sprayer can be used on ACM’s or asbestos cement considered to be in good condition. If the asbestos containing material is in poor condition, then it will need to be removed entirely. If after thorough inspection the ACM is considered to be in good condition and doesn’t pose a health risk, then a low pressure electric sprayer can be used to treat it. Using an airless sprayer is preferred on exposed or unsealed asbestos over the use of rollers and brushes as it will not disturb or damage the material and cause fibers to be released. 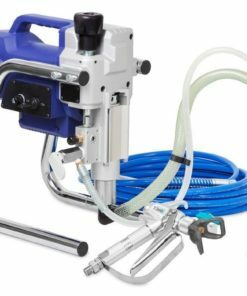 Our electric sprayer can be used to spray most water and solvent based paints. Need help? Call us on 0330 0885 675.